I’m writing this post as a warning about your puppy and leptospirosis vaccine side effects. 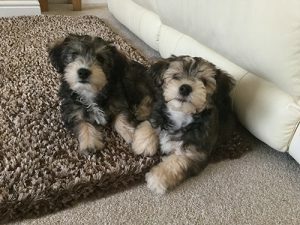 I’m off topic somewhat here but we had such a harrowing experience when we took our two little puppies to have their first vaccination, I wanted to warn you about this vaccine. They were just 8 weeks old and weighed in at just 1.37kg and 1.49kg. We were to see our usual vet who we really trust and find very gentle with all her patients. We knew she would make our puppies’ first visit to the vet a positive one. Unfortunately for us and the dogs, she was on holiday and we had another vet who we didn’t know. When we got to the surgery he quickly checked the puppies out and declared them healthy, which was good to know. We noticed he had already got vaccines lined up and we did think there were rather a lot. He started mixing one vaccine with another but we didn’t think too much of it, after all he’s the expert. He then got rather a large needle (these puppies were under 1.5kgs at this time) and before we knew it he had vaccinated the first puppy with 2ml of vaccine. This was strange because the vaccine is usually 1ml consisting of canine distemper, hepatitis and parvo virus. Unbeknowns to us, he also injected the two puppies with a Leptospira vaccine called L4, the L4 meaning it covers 4 different species of the bacterium. Well, I’ve had a few dogs vaccinated in my lifetime but I’ve never seen the reaction that our two puppies had EVER! The first one started screaming and I mean screaming and was thrashing around the large box we’d brought them in. Whilst we were trying to comfort the poor little puppy, the vet injected the other one and he reacted exactly the same way. These two little pups were obviously in agony but the vet didn’t seem to be bothered at all. We took them home, with them still yelling and shouting and tried to pick them up but they screamed louder as soon as we touched them. It was horrendous. Puppies first experience of a vet! 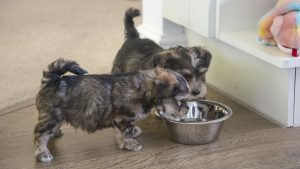 These little dogs were poorly for over two days with symptoms of hypersensitivity, high temperature, laboured breathing, shaking and lethargy. They went off their food and didn’t want to do anything. We did not take them back to the vet, after all what could he do, except make matters worse and anyway, it was painful for them if we touched them. We had to hope they got over their reaction and thought it best to keep them as calm and quiet as possible. They did start to recover after 48 hours. I wanted to warn any of you who are having your puppies or dogs vaccinated, that this vaccine is actually not a core vaccine. In other words it is optional, but our vet failed to give us that option. We thought they were just having the normal core vaccines for distember, hepatitis and parvo. 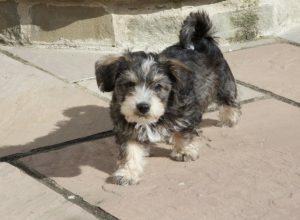 It would also seem to be the case that the worst affected dogs are those of toy breeds which would make sense. We would not have opted for the L4 if we’d been given the choice. We would prefer to check stuff out first. Vaccines are a bone of contention with us anyway. My husband has actually worked with vaccines and produced them and he knows plenty about how they work, what chemicals are used and whether the vaccine is viable. Hubby Andy has checked all the data for this vaccine and found that it is very intrinsically variable which means you haven’t the foggiest how much antigen is being administered into the dog. On top of that it has 100mcg of thiomersal in it, which contains nearly 50% mercury. So that 1ml dose of L4 equates to 49.6mcg of mercury being pumped in a little body of just 1.35kg. We contacted our normal vet once she was back off holiday and complained bitterly about what had happend. She was very upset and sympathetic and advised that we should not have the second L4 vaccine done as the reaction could be worse than before and the risk was too high. What’s more, she did say that this vaccine is only effective for 6 months! 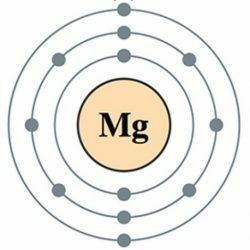 This leaves dogs unprotected until the yearly booster which will then give the dog another dose of 49.6mcg of mercury and again will only be viable for 6 months. If the vet we saw had anything to do with it, he would insist we get the second vaccine of L4 administered 4 weeks hence from the first. I can tell you that won’t happen. I will not risk the lives of my puppies for an optional vaccine which will only protect the dog for half the year anyway. As well as that he was suggesting we had them chipped at the same time! I personally think that chipping such little dogs with such a large needle is not a good idea, especially after the trauma of this vaccination and trying to make our puppies’ first vet visit a pleasant one. Here we have two little pristine puppies, both healthy, lively and full of spirit and then we inject them with a compound that has a serious poison in it, namely mercury. 49.6mcg of mercury is a horrendous burden on their little bodies and with another dose 4 weeks later, it’s ridiculous and unnecessary. Why thiomersal has to be used in this vaccine is a mystery to my husband Andy. He says there are much better and less harmful preservatives to use. Freeze drying the vaccine is one way or using formaldehyde which isn’t ideal but better than mercury. Its interesting to note that a survey was sent out for vets to fill in about this vaccine. Of all the vets contacted which was 472 if I remember correctly, only a few came back with a report about cases they had encountered of leptospirosis. I think the number was around 13 vets. Of those that reported cases of the disease, some dogs succumbed to lepto, despite being vaccinated against it! What gets me is that most vets will administer this L4 without even checking its viability. This is probably because they trust MSD who make Nobivac to have done all the trials and tests before the vaccine was rubber stamped by the European Medicines Agency (EMA). The EMA assessment report which is from the ‘Committee for Medicinal Products for Veterinary Use (CVMP) states: “The applicant (MSD) developed an in vitro antigenic mass ELISA (Enzyme Linked Immunosorbant Assay) test [sic] to determine the antigen content in the active substance batches and final vaccine batches as well as to establish potency. The ELISA test shows an intrinsic variability but the test is considered suitable for its intended use.” Doesn’t sound like too much testing and trialing to me, just a perfunctory rubber stamp for a vaccine that is sub standard with immense variability, 50mcg of mercury per dose and contra-indications which include death! Is this vaccine worth the risk? one of the 120 dogs that died after having the L4 vaccine. This variability is a nonsense and makes this particular vaccine with its contra-indications, of which MSD say there are none, not worth the risk IMHO. You must, of course, make your own mind up but I think it would be a good idea to let your vet know that you are informed and concerned about contra-indications and discuss the options. 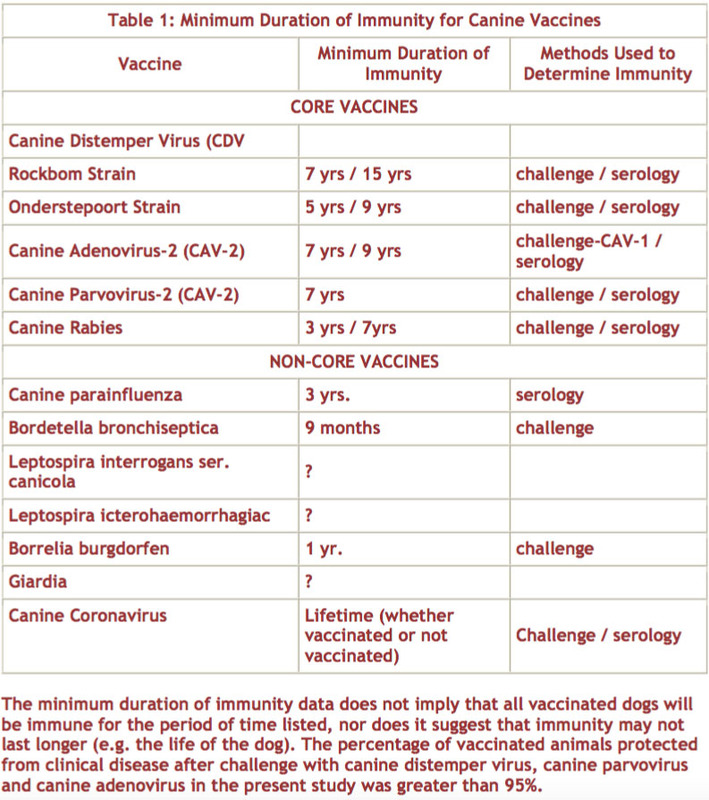 A good compromise is to vaccinate a dog at particular risk like farm dogs and those that come into contact with wild animals and stagnant water. Dogs that spend the majority of their time in a home environment would perhaps be best served not having the vaccination at all. Not one but both puppies reacted! Both our puppies reacted to this vaccine which would indicate that this type of reaction is quite common. If it was rare, you would expect just one of them to be ill not both. We are now left wondering if this reaction has left our puppies weakened with the possibility of harbouring diseases in their future. If only we had been told about this L4 and been given the option not to have it done. Make sure you know your options and make a considered choice about your pup’s vaccinations. For those worried about the outcome of your pet possibly getting this disease, lepto is a totally treatable bacterial infection. It’s only when a diagnosis isn’t made early enough that dogs suffer unnecessarily. Keep an eye out for symptoms in your dog such as fever, lethargy, excessive urination or blood in the urine and call your veterinarian immediately to get your dog tested for lepto. It is easily treated with an early diagnosis. 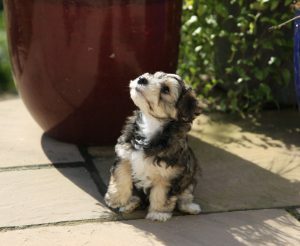 Dr Jean Dodds, has done a pilot study of ½ dose vaccines for small dogs weighing less than 12lbs. All dogs were given a titer test at 4 weeks and again at 6 months after the half dose. The tests demonstrated that antibody levels for the canine distemper and parvovirus diseases had a sustained increase in all of the study’s dogs compared to the pre-vaccination blood sample. You can see the full report here. As well as not having the second Nobivac L4 vaccine administered, we will also be asking our vet to give our two puppies a half dose of the DHP vaccine. The pups will be nearly 12 weeks old when this is administered. Please note, it is not necessary for your dog to be boosted every year for DHP. Every three years is ample with some experts, like Dr Ronald Schultz, stating that dogs are likely immune for life, just as we are after we’ve had our innoculations! Is this continual boosting just a wheeze for getting extra money from the poor unsuspecting customer and to the detriment of our dogs’ health! What do you think? Thanks for reading and keep yourself informed for the sake of your dog’s health and your peace of mind! Hi there Susie, I’m glad you’re giving the Lepto 4 a miss, it’s not that effective anyway and has mercury in it. It does have an amount of mercury in it, too much for a little pup to cope with. Keep an eye on your new puppy for signs of illness. Always feed her the best foods, organic if possible. Lepto is easily treated if caught in its early stages. Your core vaccines are necessary but once she has had her initial jabs, you can check she has antibodies with a titer test before giving boosters. If you do not need to put her into kennels, I would suggest to leave off the continual yearly boosters which are mostly unnecessary. They are, of course, a regular income for vets and big pharma. Check out some articles about boosters such as this one. Oh my! I hope your puppies are feeling better and being back to playful happy little chappies. I’m not a dog owner myself at the moment so I don’t have a lot of insight into the vaccination scheme, but you and your husband do seem to be well read up on it. I’m glad that your regular vet is sensible and understanding. Wow, poor puppy. I really can feel with the pain of the innocent creature! It never happened with any of my dogs, but, honestly, I give them only the very essential vaccinations, I don’t like to use medicines myself, either. As for the imprinting: I once had a dog cutting his artery with a piece of glass. Until the vet came, although I bound the leg tight, the dog had lost a lot of blood. The vet I had then was a man, sort of a butcher, used to treat sheep and cows- I happily found a more sensitive woman afterwards who I really appreciate (You can find some videos with her on my cat website) . So, when he came, he stitched the wound together without narcosis. From that day on the dog never allowed anybody to come near him and hold him. It was unfortunate because I couldn’t treat him for tics and fleas, it was a real mess. So I guess we need to be very aware of what we really need to do to animals and what we can avoid to not cause them too much pain. Hi there Heidi, Yes, this is the first time we’ve ever had problems with a vaccine and we’ve had many dogs over our lifetime. 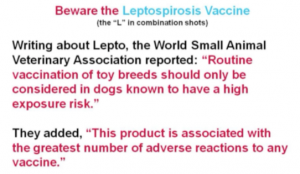 This Lepto 4 is a particularly nasty vaccine and on the main, not necessary and certainly not a core vaccine, so it is optional and should NOT be given without the consent of the owner. 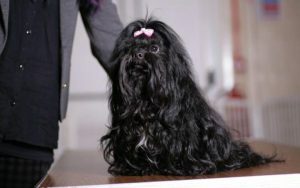 It certainly should not be given to toy breeds unless really necessary ie. the dog is in stagnant water and around wild animals. 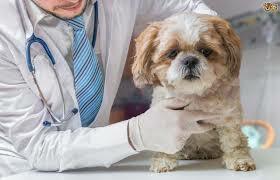 Even then, I would hesitate to give this vaccine to any dog because if the owner is aware and watching for illness, the disease will be caught early and is easily cured. As for cat vaccines, rabies and FeLV have been associated with a specific type of sarcoma. The risk of sarcoma formation after a single vaccination in the neck or shoulder region is 50% higher than for cats not receiving a vaccination. I can understand why your dog was worried about being touched. Thank goodness you’ve found a sensitive vet but still, the damage was done and you and the dog suffered all because of some brutish insensitivity. As far as the dog was concerned the vet was just hurting him and he was not going to let it happen again bless him. I suppose you had trouble grooming him too. This is some scary stuff.I feel for your puppies.Really sorry that they had to go through that ordeal.Been a medical profession, I have an obligation to disclose to the patients what the medication is all about and the possible side effects.I believe that in this way, they are informed and aware of what may happen. It is so sad, that the the vet in question did not inform you guys of the vaccines potential side effects and its use thereof.I can only understand your frustration and disappointment. Thank heavens these beautiful pets lived through the ordeal as things could have been so much worse. I will share this article with all my friends and family. Hi there Roopesh and thanks for your comments. Yes indeed, we were very disappointed with this vet. I understand that in the US if these contra-indications had not been disclosed to us, the vet in question could be reported and repremanded. What an absolutely appalling situation! We have German Shepherds and we opt to vaccinate our puppies ourselves based on several bad experiences, outrageous prices, and lack of professionalism. We had a champion German Shepherd Dam that we decided to have spayed after 2 healthy litters. The vet scheduled to perform the surgery had an emergency and decided to have his associate (the vet we had flagged as “NOT TO SEE ANY OF OUR PETS”) perform the simple procedure. When we showed up to pick her up we were devastated. She was covered in her own feces (Remember she had a surgical incision), weak and had a very jagged incision that was 8 inches in length (normally the incision is about 2 inches). The Vet asked us to come into his office for a private conversation where we were informed he had accidentally nicked the intestines and while trying to repair that incidental incision, he also nicked an artery! So he said, “I didn’t have time to make an accurate incision along the abdomen so her skin got ripped.” My beloved and highly spoiled family member and champion female was sent home with a horrible surgical site that overlapped. At the follow-up appointment, we saw the vet that was originally trusted to do the procedure, and when the staples were removed, the areas where the skin was overlapping separated leaving a tissue paper thin, very fragile layer of skin. The incision site healed but the damage to the intestines resulted in her passing away from her inability to absorb and metabolize food properly. Like I mentioned before, we have had horrible experiences and now opt to vaccinate our precious puppies ourselves. I am thankful you had a happy ending and can’t thank you enough for sharing your story and research. Bless You and Thank You–if your efforts save just 1 life, it’s priceless. Hi Shawna, it would appear you’ve had an even more upsetting experience than we have. I am absolutely appalled at your story. I don’t know how some of these vets gain their certification when they can make such fundamental errors during what should be a simple and straight forward operation. I’m afraid, as with the vet we had, some vets seem to be desensitized and treat their animal patients like a piece of meat. I sincerely hope you sued the socks of this vet. He should be struck off and ignoring your wishes to not have him treat your beloved animal, is a disgrace. My word! What an awful experience. Thanks for warning us about the leptospirosis vaccine side effects. I’m glad your pups are better, but it must have been horrific for them. I don’t trust any vaccine, not for a pup or kitty or human. There are reasons that vaccines are controversial. I had two cats die of cancer. The tumors grew at the injection site of their vaccines. In those days, I accepted everything the vet recommended. Not now. Crikey Gary, it looks like there are some real horror stories out there, just have a look at Shawna’s comment. Although we were researching the effects of L4 on dogs particularly, I did notice something about cats getting cancer at the injection site and having your confirmation makes you realize that these ‘contra-indications’ (of which the pharma company says there are none), are rife. This kind of information should be known by everyone, not only pet lovers. My husband, who worked on foot and mouth, equine flu and feline leukaemia vaccines, knows exactly what goes into them and is appalled that mercury is still being used. But apart from that he said that oil emulsion vaccines always caused a lump on cows at the injection site and whats more that lump had to be cut away before the cow could be sold for meat! He said the lump was always the size of a tennis ball. I’m wondering what kind of vaccines are used on cats and kittens and I will be researching it for a future blog. Poor little things, they are so cute. Really bad that they were administered this vaccine. 120 reported deaths so far, you would think that the vet would be kept abreast of such reports and protect his or her reputation by ceasing its use. What a terrible experience I feel so bad for your puppies. The L4 vaccine sounds way to risky to be recommended in general. I am not sure I would want to use that vaccine at all considering as you said that, Lepto is totally treatable. Sounds like money and greed in the medical world are counteracting good judgement. How are we as innocent pet owners supposed to know that our doctors are giving out these terrible vaccines. Well thanks to your post I will research before any vaccines go into my pets. Thank you for the post. I am so sorry for your two little puppies. That is a shocking and traumatic thing for their tiny bodies to go through. You must have felt so helpless. 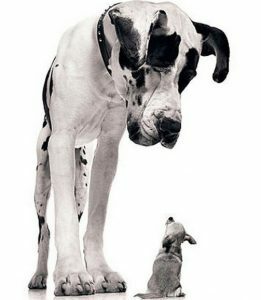 For any dog and owner to be put through that, it really beggars belief that they would use a substance such as Mercury. It should be banned altogether. I just can’t help thinking that these Pharmaceutical companies just have the money in mind. Just veering off track again, my daughter was offered, almost expected to have an injection to prevent cervical cancer. She has only just turned thirteen. I was the only mother that refused it for the reason of side effects. I deemed it as unnecessary. The other girls kept saying to her she was going to die. A bit extreme. That’s teenagers who do not know the facts for you. I think that if she is ever unlucky enough to get that after all of our conversations of hows and why’s then it is to be treated at that point in time. Because it still may not prevent it. Side effects can result in death. I wasn’t prepared to take that risk. She has had her other vaccinations, the ones every male and female have, though. I had read about several instances of death occurring after this vaccination had been given. The importance is that whether it is our pets or us, humans, we must make our own researched and informed decisions. Thank you for your thought provoking article. Hi there Andi and I can see that this subject has greatly affected you too. I think you were wise to refuse the cervical cancer vaccine for your young daughter, I certainly would not have given my permission for it either. You do need to stand up for your rights and not be led down the path of pharmaceutical drugs, which in my mind is definitely out of control. We need to get back to basics of why we’re sick not exacerbate our problems by pumping drugs and toxins into a body that’s already fighting an infection.